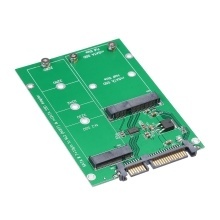 Convert B-KEY SATA M.2 SSD to SATA 22PIN interface. Plug and play. It does not need any driver. Only support SATA protocol M.2. It is universally compatible with various operation systems. It supports 4 kinds of different sizes SSD, including 2230, 2242, 2260, 2280. Stable control chip with high power. Great and sturdy performance. Compatible with both laptop and desktop,Plug and play.No driver is required. Support all SATA protocol M.2 SSD. Do not support NVME M.2 SSD and PCI-E M.2 SSD. Support SATA-based B-key. Not support M-key.